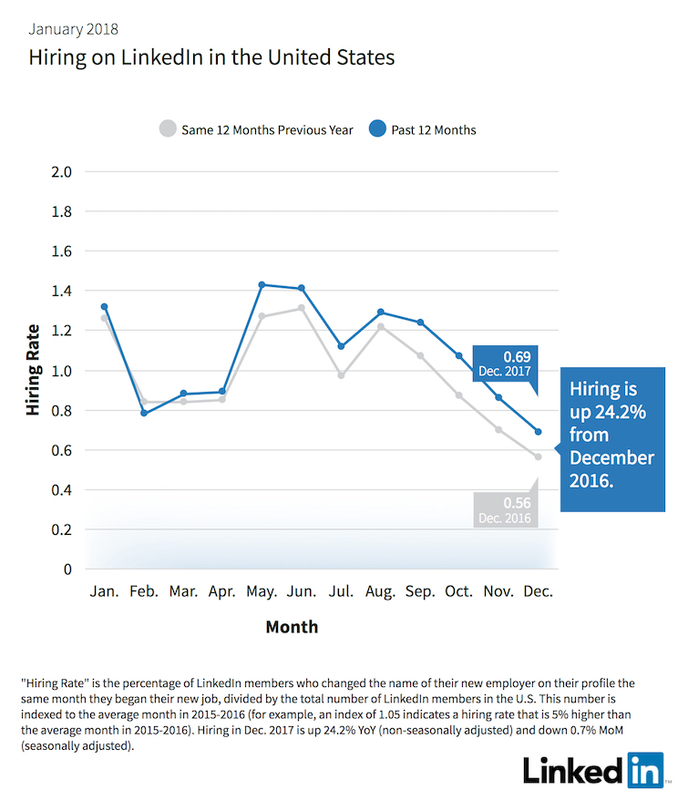 2017 ended on a strong note with hiring up 24 percent in December than the previous year, according to LinkedIn’s January Workforce Report. Employers added the most jobs in the financial services and insurance industry, followed by aerospace, automotive and transportation and architecture and engineering. 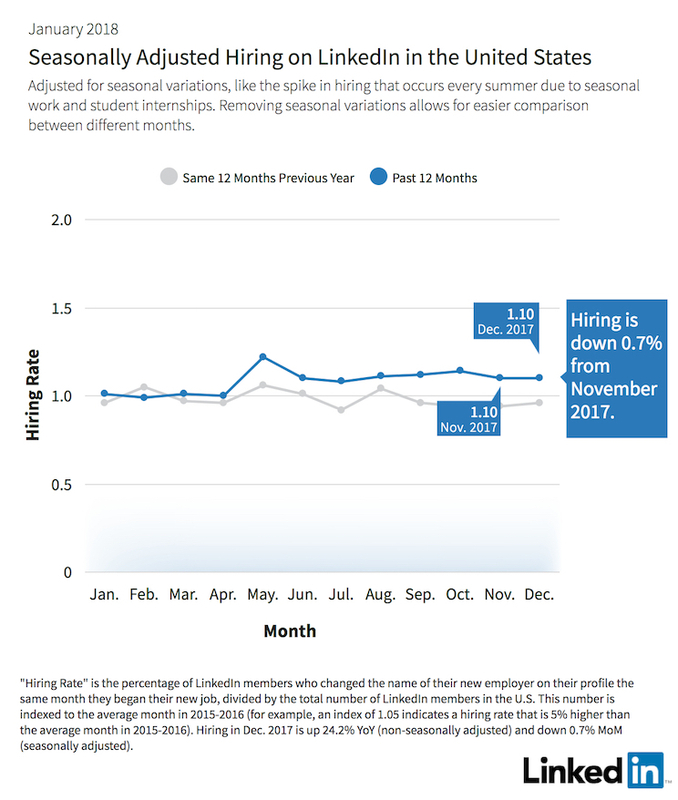 Seasonally-adjusted hiring (hiring that excludes seasonal hiring variations) was 0.7 percent lower in December than November 2017. Sunbelt cities beat coastal cities for hiring – Over the past year, hiring growth in Houston, Phoenix, Dallas-Ft. Worth, and Cleveland-Akron surpassed the national average, and blew past hiring growth rates in big cities like New York City, Seattle, or San Francisco. Compare Houston’s 14.6 percent growth in hiring to the national U.S. average of 10.4 percent, or Washington, D.C.’s modest 3.5 percent. Hiring growth doesn’t always mean migration growth – Houston, Phoenix, and Dallas-Ft. Worth are all outperforming the country in terms of hiring growth. But rapid growth in hiring rates doesn’t immediately translate to more people moving to these cities. For example, Houston is losing workers to petroleum-rich Odessa-Midland, likely due to the rebound of the oil and energy sector there. Data mining, business development, and sales skills in demand – Our recent Emerging Jobs Report catalogued the top 20 emerging jobs in the country. The skills associated with these roles include data mining, business development and relationship management, and sales. Data mining skills are in highest demand in Dallas-Ft. Worth, Los Angeles, and New York City. Business development and relationship management skills are in highest demand in the San Francisco Bay Area, Washington, D.C., and Los Angeles. And sales skills are needed in the San Francisco Bay Area, Washington, D.C. and New York City. Click here to read of our January LinkedIn Workforce Report, including which cities are losing the most workers, and which are gaining the most. More than 143 million workers in the U.S. have LinkedIn profiles; more than 20,000 companies in the U.S. use LinkedIn to recruit; more than 3 million jobs are posted on LinkedIn in the U.S. every month; and members can add more than 50,000 skills to their profiles to showcase their professional brands. This gives us unique insights into U.S. workforce trends.